The popularity of films like Insidious: Chapter 3 and M. Night Shyamalan’s The Visit have signaled a wonderful trend in genre pictures. 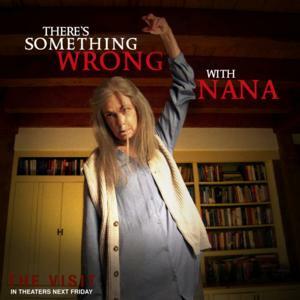 These box office successes have revolved around characters like Lin Shaye’s Elise and Deanna Dunagan’s Nana, powerful females who are well above the age of first communion celebrations and tender coming out parties. These women have been complex and vibrant and, in the case of Dunagan’s Nana, believably deadly. Thankfully, Dunagan, a powerhouse veteran of the Midwest theatrical trenches, recently took a moment to speak with me about her career and some of her reactions to making The Visit. 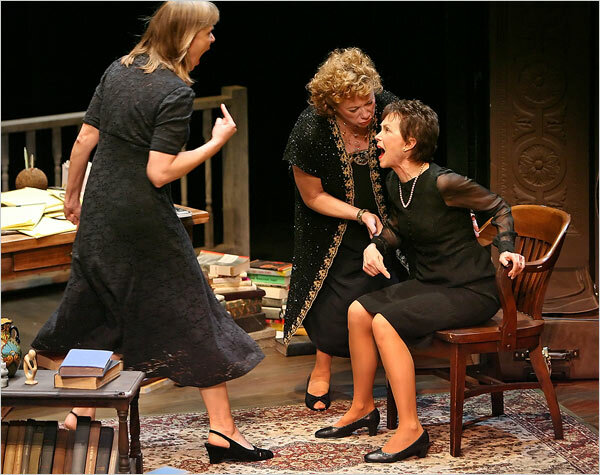 A Tony Award winner for her powerful performance of Violet in Tracy Letts’ acclaimed August: Osage County, Dunagan, also, shares her joy over her current role in a revival of Scott McPherson’s contemporary classic Marvin’s Room. McPherson, an activist and actor, was one of the many prominent and important artists to die from AIDS in the 90s. The endurance and hopeful strength that many of those first victims needed to survive in those black days is reflected a bit in his creation of Aunt Ruth, the sunny role that Dunagan so brightly ignites. BGHF: Let’s start from the beginning, Deanna! You grew up in a small town in Texas. How did you get involved in theater? 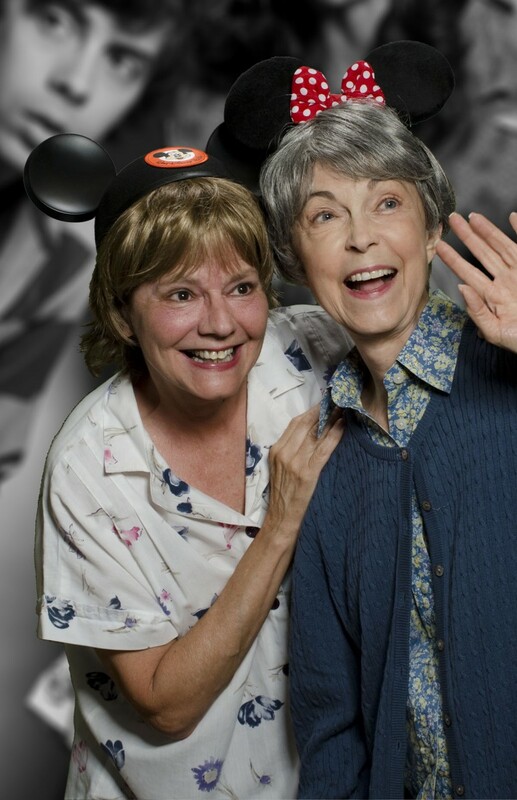 Deanna Dunagan: Well, I spent my childhood getting the kids together and putting on plays. In West Texas there was not much theater to be found. But for some reason, from my early childhood, I knew about plays. I put them on. I don’t really know how that happened. We had a Town Hall series that came through. There were magicians, hypnotists and speakers and I guess they had plays, occasionally. But from a very early age, I was really aware that was what I wanted to do. Being from West Texas, I didn’t think I had a shot at it. I thought you had to be a star or be in the movies or be on Broadway to be an actor. How would I ever get there from Monahans, Texas? It seemed impossible. But I actually think I was destined to do this. From my earliest memory, that’s what I wanted to do. First when I was little, I would make up the plays or we would do fairy tales. But then in junior high, I would find a script in a book, somewhere. I’d get the kids together and we’d rehearse on our own. I’d go to the principal and say, “We have a play to put on! Can we put on our play?” They’d have an assembly and we’d put on our play. I made opportunities to do that all through my growing up years. I really think that this is what I’m supposed to be doing. BGHF: I think anyone who has seen you in any of your roles can attest to that. Currently, your Aunt Ruth in Shattered Globe’s revival of Marvin’s Room is such a delight! DD: I haven’t played anyone like her since my ingénue days. She is just totally loving and trusting. She’s without a mean bone in her body. She’s just the most lovely, sweet lady that you can ever imagine and she has endured so much in her life. Yet, she has nothing but love. It’s a welcome part. I love being her. She’s, also, very funny. I don’t think that I’d love it if she weren’t funny – it might get very boring. But she’s very fun. BGHF: It’s, also, allowed you to work with your long time collaborator and another prominent woman in Chicago theater – director Sandy Shinner. DD: She was my very first contact here in Chicago. We’ve remained friends. I’ve done 7 plays with her. There came a time at Victory Gardens when there just weren’t roles for me or I was busy. So, we didn’t work together for awhile. But we were always friends. BGHF: I need to ask you about a more obscure role now. Do you recall working with David Hedison (The Fly) in the 80s crime thriller The Naked Face? BGHF: I remember my whole family settling down to watching that on cable, one Saturday night! DD: You’re kidding! I was his wife! That was interesting. I got that role because I dressed correctly for the part. Bryan Forbes, who was the director and a wonderful guy, came to audition in Chicago. He had been out in L.A. auditioning. He was appalled at the way people came in – torn blue jeans and t-shirts. I was auditioning to play a doctor’s wife, so I came in dressed the way that I thought a doctor’s wife would be appropriately dressed. (Laughs) I think that’s why I got the role! I had a couple more scenes. The other scenes I had wound up on the cutting room floor, unfortunately. That movie was long, anyway. But, that’s so funny that you know that movie! Not many people do! BGHF: I loved that movie. Roger Moore released his memoir, a number of years ago, so I went back and re-watched it then. DD: He was so funny. He was the loveliest man. Of course, I was nobody, but I was supposed to be his sister-in-law. So, the director would yell, “Cut!”, and Roger would, immediately, say, “Do you know the one about the Irish Man?” (Laughs) He was, constantly, entertaining us with funny stories and jokes. He was a very nice man. BGHF: Well, you definitely have much more of a presence in The Visit, for which all the fans are grateful. In particular, you do such calibrated work as Nana, telling that spookily beautiful story to Becca (Olivia DeJonge), as she’s being interviewed by her. DD: It’s so interesting. 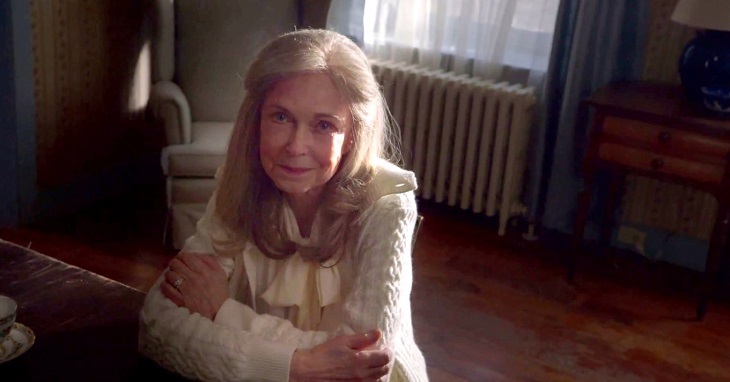 One of my agents wrote me this morning to tell me that he finally saw The Visit. He mentioned that scene. I was gratified that he picked that out. BGHF: It was beautiful work. There definitely wasn’t anything staged or over the top with it. DD: Thank you. I loved that. I believe that is among some of the best work that I’ve ever done, actually. It equals other work I can think of — like in August or Desire Under the Elms or The North China Lover. There was this fairy tale quality about the story she told. Of course, it was a horrific story about her murdering her children; putting them in the pond, in the suitcase. I assume she put them in there, alive, which is even more horrifying. In her madness, she thought that was the way to save them. That they were in danger and putting them in the pond would ensure that they would get to the other planet and be saved. She told the story as if it were a fairytale and then only broke down at the end. Night wrote a beautiful scene. It was a beautiful piece of writing. It was very complicated, interesting… I really got into that. BGHF: It, also, brought you full circle, in way. You started out, as a young girl, bringing fairytales to the stage and years later, you deliver one, so beautifully, on screen. DD: Yes. (Laughs) That’s right! That’s right! That’s interesting! BGHF: Was The Visit another surprise for you? In 2008, you won the Tony…and now the lead in this popular film? DD: (Laughs) Well, the Tony was just impossible. It would be like winning the Academy Award. I never even thought of it. I would have thought I had given any possibility of that up when I left New York and came to Chicago. I never thought about it – ever! I watched the Tony Awards on TV, like everybody else. It never occurred to me that I would win a Tony. As for The Visit, I remember my agent saying, “This may have a cult following.” But, it never occurred to me that it would become so popular. It really is an ensemble film. I didn’t feel like I was starring in it. Kathryn Hahn is so well known. She has a series and has done some pretty big films. All the pre-publicity was saying that it starred Kathryn Hahn. So, I didn’t think that I would be particularly noticed. When anybody asked me, I said that it really starred the kids. It was the kids’ story. BGHF: The kids are wonderful, but so many of the fans believe that Nana really is the standout. I remember reading press that mentioned that you and Kathryn Hahn as the focal points. DD: That was after it was released. It was interesting. I think in the New York Times that they did a paragraph about Kathryn and how she reminded them of Karen Black. Do you remember Karen Black? BGHF: Oh, yeah! I loved her. DD: Then they mentioned me with Peter. The major press really didn’t give Nana much love. But the minor press and the bloggers have loved Nana. BGHF: I’m not surprised. They’re the true voice of the public. It, also, shows that audiences crave more strong female characters – of all ages! What an honor that you are such a prime representation of that! DD: You know I once went away from the theatre. I went to Mexico to write my thesis on costume design. I fell in love with a bullfighter and I was going to stay down there. But people kept calling me. The Dallas Theatre Center was doing The Apple Tree. They couldn’t find anybody, so I came back and auditioned. It was being directed by Lee Theodore, who was the original Anybodys in West Side Story. So, I did that and then I went back to Mexico. Then I got hired by The Globe of the Great Southwest in Odessa, TX. They asked me to come back and do Lady Macbeth. I went and did that. I would try to go away from it. I fully intended to marry my bullfighter and live in Mexico. I was doing a lot of singing down there with my guitar. But theater kept on calling me back. It was the universe. I fully believe that I am doing what I am supposed to be doing. On Tuesday, March 17th, the same day that the Insidious Chapter 3 trailer dropped online, a handful of lucky Chicago residents got to see this preview launch at the historic Vic Theatre. Local haunting expert Ursula Bielski warmed the audience up by introducing participants to the ghosts, including one named (aptly enough) Victoria, that have been rumored to linger along the arches of the well known establishment’s halls. She, also, enthusiastically asserted that the Insidious films contain accurate representations of astral projection, something that she and her brother have experienced in her own investigations into the mysterious and unknown. The primary treat of the night, though, was the presence of actress Hayley Kiyoko. Kiyoko, currently appearing as a regular on CSI: Cyber, portrays Maggie, the best friend of the lead character, Quinn (Stefanie Scott). In addition to the nice adjustment of the series focusing on a young woman, Kiyoko also revealed that her character is Quinn’s primary source of support during the ghostly occurrences in the film, hinting that the feature will have some increasingly strong femme overtones. The friendly Kiyoko, admittedly not a fan of the horror genre due to being easily frightened, also maintained that making the feature was just as scary as watching it. 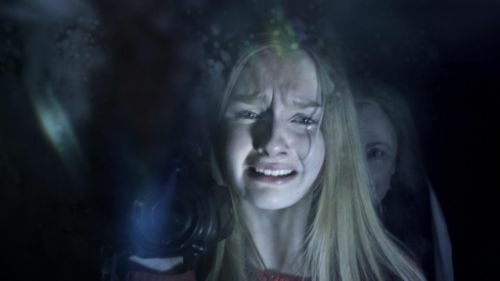 While she and the other actors knew the circumstances behind the scares in each scene, director Leigh Whannell would often vary the rhythm in which the shocks where delivered when filming, allowing for maximum fright among the cast. 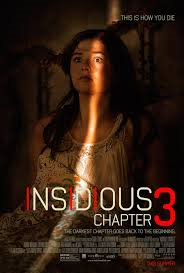 Keep up with Insidious Chapter 3 as it makes its way toward theaters at https://www.facebook.com/InsidiousMovie. More information on Bielski and her Chicago Hauntings Tours is available at http://www.chicagohauntings.com, as well.